Tourism provides 13,100+ jobs in Dare County, employing 1/3rd of our citizens. 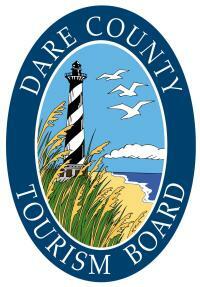 Annual Dare County tourism generates more than $102 Million in State and Local tax revenue. Because tourism generates this revenue, each Dare County resident enjoys tax relief of $2,869.94 annually. Dare is #5 among North Carolina’s 100 counties in terms of visitor spending. A 6% Dare County Occupancy tax (collected when visitors rent short-term lodging) is shared between Dare County and the six municipalities, the Beach Nourishment Fund, and the Dare County Tourism Board. Of the Occupancy tax net proceeds received by Dare County and the towns, Dare receives 32% and the municipalities split the remaining 68%. Beach Nourishment receives 2% of the Occupancy tax net proceeds. The Tourism Board receives the remaining 1% of Occupancy tax, and 1% of a Prepared Food and Beverage tax. By law, 75% of these dollars are to be used to promote tourism and for the cost of administration. The remaining 25% are for programs or services needed due to the impact of tourism. Occupancy tax dollars reduce your ad valorem property taxes significantly regardless of where you own property in Dare County. 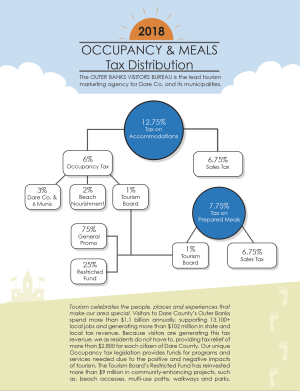 *View the Distribution of Occupancy & Meals Tax Collections.